Read any of our past blog posts about social media and you’ll find that Facebook has many options for your business. One more option that we want to make sure to highlight is Facebook groups. Since we know you have a task list a mile long, I’ll get right down to it. Facebook groups provide one all-encompassing, all-important thing: community. A Facebook group is page created by a business to promote activities and discussion surrounding that business’ products or services. Members of the group are free to post and discuss with more freedom than on a Facebook page. So why does your business need this? A few reasons. You can keep your group open or closed. You can also have every group member submit a form to be a part of the group, pending approval by a page admin. Even more, you have a deeper understanding of who is actually in your audience, therefore you are able to cater to their needs on a more profound and specific level. No worries though - each post by a member of the group can still be approved by you or another admin, that way you can control what the public is reading about your business. With this select group of people who like your page that have chosen to join your group, it crafts your perfect audience. So instead of putting your services or product out there for a cold audience to hopefully grab hold of customers, you can get your launches and news to the people who you know are already benefiting (or want to benefit) from your service or product. This drives your organic leads and lowers your marketing budget! Did you just wrap up a mastermind class or webinar series? Launch your group post-event to keep the community going. Here, people can discuss how they are practicing what they learned in your course, whatever that may be. This is also great for the launch of longer-length courses, so that as participants move through the course, they can post their questions, struggles, and wins with the group. This helps to hold members accountable for participation and keeps them engaged, creating more meaningful leads and relationships, enabling you to work them through a full sales funnel. So, what's the real difference? The success of your Facebook group depends on a lot of things. Mostly consistency on your part. Having someone who is always monitoring and engaging in your Facebook group on your behalf will groom your audience. She Can Coterie offers all things Facebook in our social media packages. We can generate content, stay consistent, and engage with your audience for you! Check out our services for full social media package options. Let us do all the nitty gritty things so that you can do more of what you love with who you love! Don't stop there... give your social media profiles some love too! We have a fun freebie that can help you get your social media profiles looking great so you can convert your followers into paying clients. Sound good? Sign up below to get started! Hooray! 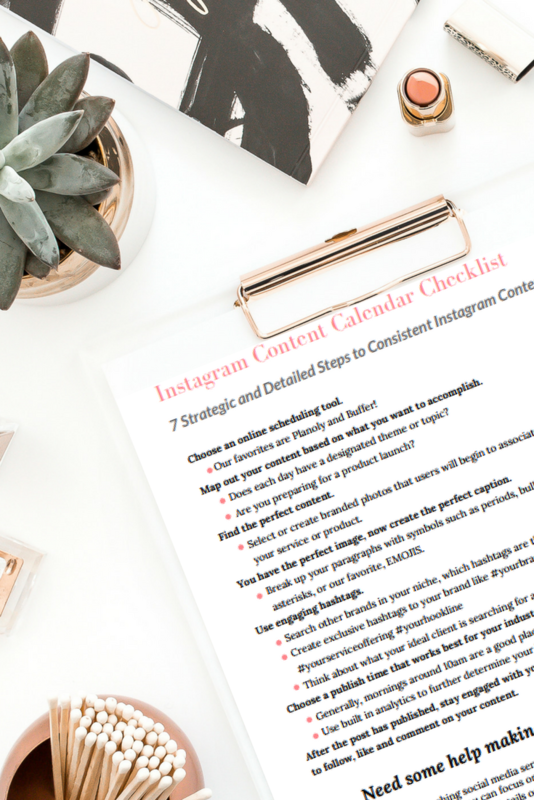 You're on your way to planning amazing Instagram content that converts your followers into raving customers and clients!